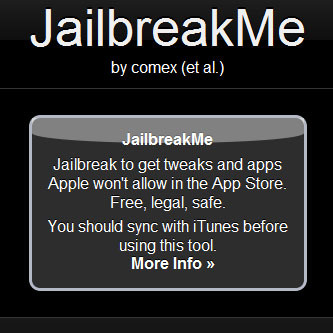 The developers behind Jailbreakme have released an “official” version of their Jailbreak 2.0 application for the iPhone 4, enabling iPhone owners to jump ship from Apple’s tightly-controlled universe of iPhone applications and install any application they like on their devices—with most of the non-Apple-approved apps being available via Cydia. And, where previous iPhone jailbreaks risks running afoul of the Digital Millennium Copyright Act—at least in the United States—a recent ruling from the Library of Congress enables users to jailbreak their devices without facing DMCA charges. Of course, iPhone 4 owners interested in jailbreaking their phone are advised to use all due caution: the procedure can, render a device non-operational if something goes wrong. However, in most circumstances, users should be able to undo the jailbreak by connecting the iPhone to their computer and using iPhones “Restore” function. To install the jailbreak, users just connect to the Jailbreak site using the iPhone’s built-in Safari browser and proceed from there. Early reports from users of the jailbreak reported problems with the iPhone 4’s FaceTime Wi-Fi video conferencing feature and SMS messages; these issues have apparently been resolved. The jailbreak does not currently work on iPads, but apparently functions on iPhone 3G, 3GS, and iPhone 4 models, as well as the iPod touch. However, enthusiasm for services and applications not approved by Apple—think Google Voice—is high among some iPhone owners. In addition to enabling users to install applications from sources other than the iTunes App Store, jailbreaking will enable iPhones to be used on networks other than Apple’s approved carriers; however, not all iPhone features (like visual voicemail) will necessarily function on carriers that don’t support the iPhone. Jailbreaking may now be deemed legal by the Library of Congress…but that doesn’t mean Apple has to make it easy for users of jailbroken iPhones to get the most out of their devices. Jailbreaking an iPhone typically means iPhone users will no longer be able to get iPhone software updates. Apple is very unlikely to support any sort of iPhone software updates—even security patches—for jailbroken devices. Jailbreak 2.0 is donation-ware: the developers encourage users to contribute via PayPal if they find the tool useful.